After our dinner at M Shanghai, Christine, Lisa and I headed to Miller's Tavern (millerstavernbrooklyn) for after dinner drinks. After I read through the menu, I knew I would order a hot drink. When it's freezing outside, it just makes sense. 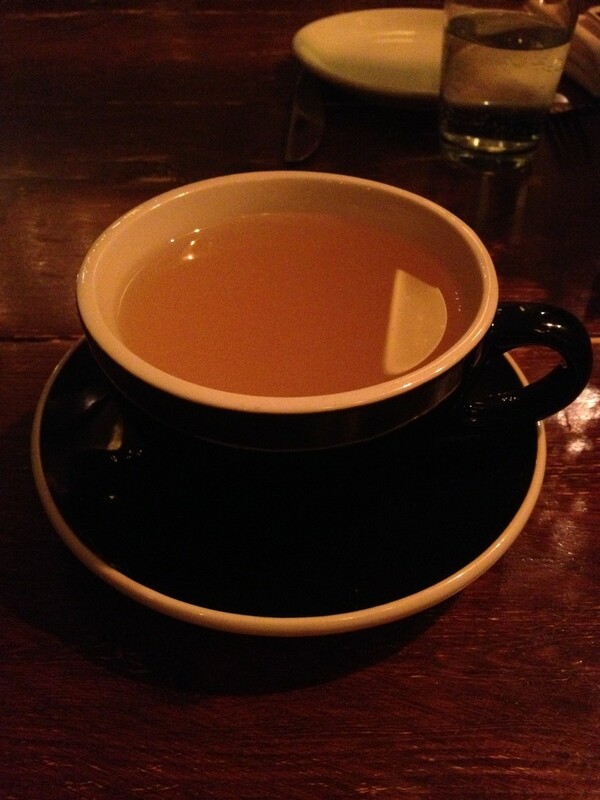 I started with the Hot Buttered Rum, made with Dark Rum, Clove and Vermont Butter. This drink was nice and I loved the cup it was served in! I'm sure you can see the butter clustering at the top of the drink. It had a hint of creaminess from the butter but wasn't overpowering. If anything, it could have benefitted from more clove/spices in it to up the flavor profile. It was good but not particularly memorable. For my second drink, I ordered The Regulator - another hot cocktail! It is made with Applejack, Bourbon, and Ginger. This drink had more flavor, likely due to the Applejack - an Apple Brandy. I really enjoyed it! After we had our first two cocktails, we ordered a dessert to split between the three of us. We ordered the Molten Chocolate Cake served with gelato and sea salt. For this evening, the gelato was a caramel flavor. SO TASTY! We didn't order any food here beyond the dessert, though Lisa's boyfriend joined us and got the burger. It looked yummy! Since the dessert was really tasty, it could be worth coming back here for an entire meal.